At my core, I am a baker. I LOVE baked goods… cupcakes, cakes, cookies, caramels, etc. I loved baking so much that I had my own cake design business for several years. One tiny little problem… everything I used to make was loaded with gluten and processed sugars. Sure, I used the highest quality ingredients out there – imported chocolate, European butter, Madagascar vanilla. But, at the end of the day, there was a lot of not-great stuff in those tasty treats, and that just doesn’t jive with my Paleo lifestyle these days. That said, I’m still not willing to give up the OCCASIONAL baked treat, and figuring out how to make “healthier” versions of past favorites is going to be an ongoing goal. I am super excited about this recipe… my husband and I test-drove it this weekend, and it is stinking delicious. Seriously. I had to get it out of the house as quickly as possible. An extra bonus? It was ridiculously easy to make. Grease sides and bottom of springform pan. Line bottom of pan with parchment paper and grease it as well. 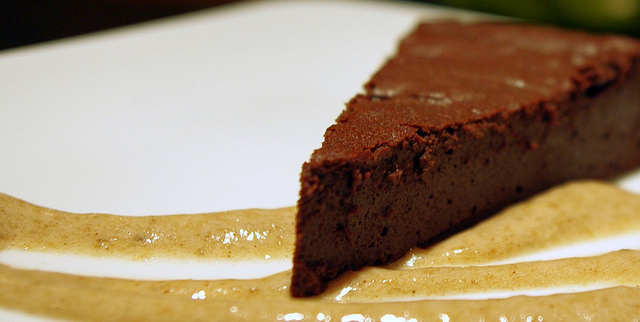 Place bittersweet chocolate and cubed butter in a microwave-safe bowl. Microwave for 20-30 seconds at a time, stirring well and scraping down sides between each cooking period. Continue until chocolate and butter are completely melted and well-combined. You can also do this over a double boiler, but honestly, this is the easiest way to do it. Transfer the melted chocolate/butter into the bowl of your stand mixer (with whisk attachment) and turn on low. Add each egg one at a time, making sure it’s well-combined before adding the next. Add the agave nectar and mix until combined, scraping down sides as needed. On low, spoon in cocoa powder. Mix on medium, stopping to scrape down sides as needed. Once batter is well-combined, pour into prepared springform pan, using a spatula to evenly spread the batter and smooth the top. Place on the middle rack of your preheated oven and cook for approximately 35 minutes. 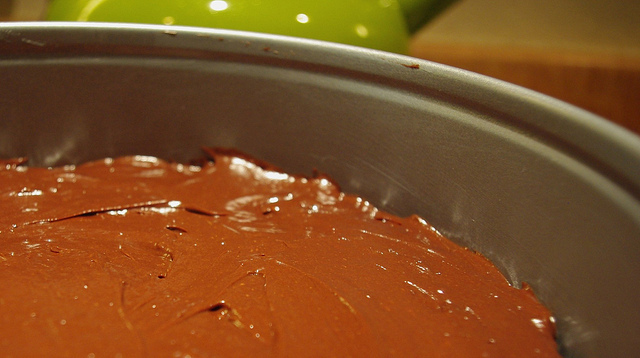 Start checking your cake around 30 minutes in case your oven runs hot. To test for doneness, insert a toothpick into the center of the cake – it should come out dry. Remove cake from oven and let cool completely on a wire rack. While cake is cooling, create your banana sauce… Peel two ripe bananas and place in your food processor with blade attachment. Puree until smooth. Add 1/2 tsp. of cinnamon to taste, pureeing until well-combined and smooth. Transfer to a serving container. Once cool, remove the side of the springform pan and transfer cake to your serving plate. Cut and serve cake with a smear/dollop of the banana sauce and perhaps some fresh banana slices. I can’t wait to try this cake for my stepson, Peyton. He’s a chocoholic like me, and I have a feeling this one will pass with flying colors. I think he’s been missing having baked goods around the house! 😉 At some point, I think I’ll play around with this and maybe a coconut sauce or coconut ice. Could be fun! Looks delicious – and I am glad to hear that you have not totally given up baked products 🙂 Life without the simple pleasures of food would not be very much fun! Thanks, Natalie! So lovely to hear from you! It’s true, there’s no way for me to get TOTALLY away from baked goods. 😉 That said, I’m loving what I’m cooking these days… very satisfying stuff! I hope you guys are doing wonderfully! This looks fantastic. I plan to make this with less sugar (on a candida diet) freeze and thaw pieces when I get a craving. Probably will serve it with some coconut milk whipped cream or a dollop of raw almond butter and a few raspberries. Yum!! This recipe came out perfect. Thanks for sharing. Has anyone tried the recipe with less Agave? I’m looking for a cake or brownie recipe with the lowest amount of sugar (whether it processed or not)…thanks! I made this to bring over to a friends last night and it came out wonderful! It was delicious and had a nice silky texture. The banana-cinnimon sauce is a perfect compliment to the cake. Thanks for the great recipe! Wonderful! I’m so glad it worked out for you! 🙂 Thanks for letting me know! Awesome – thanks for the tip!! Im taking this to a potluck book club. How long will the banana sauce be good for? I need to make it ahead of time. Yay!! 🙂 Sounds like it was a fabulous dinner!